This visible-light image shows the galaxy dubbed UGC 3789, which is 160 million light-years from Earth. PASADENA, CALIF. ? Astronomers have directlymeasured the distance to a faraway galaxy, providing them with a yardstick thatcould help determine just how fast the universe around us is expanding. "Measuringprecise distances is one of the oldest problems in astronomy, and applying arelatively new radio astronomy technique to this old problem is vital tosolving one of the greatest challenges of 21st century astrophysics," saidteam member Mark Reid of the Harvard-Smithsonian Center for Astrophysics (CfA). Using theVery Long Baseline Array (VLBA) in New Mexico, the Robert C. Byrd Green BankTelescope in West Virginia and the Effelsberg Radio Telescope in Germany, the astronomers determined that the galaxy UGC 3789 is 160 million light-yearsfrom Earth. The workwas presented here today at the 214th meeting of the American AstronomicalSociety. With theradio signals observed by the telescopes, they precisely measured the linearand angular size of a disk of material orbiting the galaxy's central black hole.Water molecules in that disk act as so-calledmasers to amplify radio waves (in the same way, lasers amplify lightwaves). "Wemeasured a direct, geometric distance to the galaxy, independent of thecomplications and assumptions inherent in other techniques," said teammember James Braatz of the National Radio Astronomy Observatory (NRAO). "The measurement highlights a valuable method that can be used todetermine the local expansion rate of the universe, which is essential in ourquest to find the natureof dark energy." Dark energyis an unexplained force that is pulling galaxies away from each other at anaccelerated pace and is thought to make up 70 percent of the mass and energy inthe universe. The rate of that pull is called the Hubble Constant. Thedistance to UGC 3789 isn't the first to be measured directly with thistechnique ? in 1999, measurements done with the VLBA used water masers todirectly measure the distance to NGC 4258, 23 million light-years away. Butthat distance is still too close to accurately measure the Hubble Constantbecause the movement of NGC 4258 away from the Milky Way could be influenced bylocal effects. Thedistance to UGC 3789 extendsthe milepost seven times more distant. "UGC3789 is far enough that the speed at which it is moving away from the Milky Wayis more indicative of the expansion of the universe," said team memberElizabeth Humphreys of the CfA. At least 10more galaxies as far away as UGC 3789 will be needed to refine the HubbleConstant to within 3 percent, Braatz said. "Thegoal is an ambitious one. We don't know yet whether you can achieve that,"he said. His teamhas already surveyed 2,000 galaxies and found 120 with water masers, seven ofwhich occur in a disk as in UGC 3789. "Of those seven, we might get? gooddistances for three or four," he said. 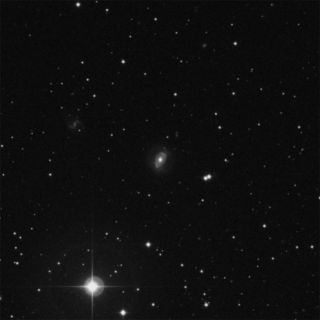 Astronomershave their eyes set on an even more distant galaxy, NGC 6323. The maser disk ofthis galaxy has been image by Cheng-Yu Kuo of the University of Virginia. "Thevery high sensitivity of the telescopes allows making such images of galaxieseven beyond 300 million light-years," Kuo said. Butastronomers won't have to settle for a 3 percent value of the Hubble Constantforever, Braatz said. "We could eventually do better than that. "Bigger telescopes, such as the Square Kilometer Array, currently in the works,could refine the value even more.